NIXEN, (Titles: AD/BH/IPOI/IPO1/SCHH1/SCHHI/A1/A1/82/SG ), Excellent hip and Elbows. The son of is TWICE WORLD CHAMPION VA1/SG1Zamp vom Thermodos. His grandfather is THREE TIMES WORLD CHAMPION VA1/VA1/SG1 Vegas du Haut Mansard. 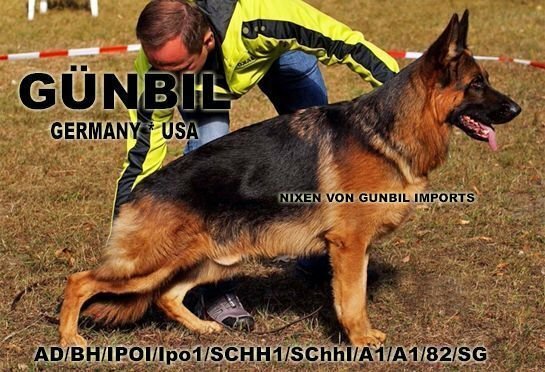 He has a working title IPO1 title (Schutzhund 1) in Germany (IPOI/SchH1) and has completed his Breed Survey, recommended to breed (Kkl1). Big, strong, masculine, very expressive, strong and powerful, SUPER HEAD, SUPER MASK! Excellent type, SUPER COLOR, very healthy pedigree. EXCELLENT FAMILY PROTECTION DOG, LOVES CHILDREN, EXCELLENT HOME MANNERS, CONFIDENT, STABLE NERVES, CLEAR IN HEAD, SAFE NATURE, HAPPY DOG! IDEAL FOR FAMILY! TURN ON (BARK) AGGRESSIVELY, TURN OFF AGRESION, ATTACK ON COMMAND, RELEASE BITE, RELAX AND PLAY! ZW = 82 (Excellent - Healthy Hip Value) - More info, please click here!